We go off the beaten path and into the uncharted hinterlands of Northern Virginia to visit some of the Commonwealth’s most acclaimed wineries. It’s not often you get to accuse central Virginians of thinking they’re the center of the universe. But when it comes to the local wine scene, we often treat the Monticello AVA as the be-all-end-all. Now it wouldn’t be fair to attribute this myopic view purely to arrogance. For starters, central Virginia IS the center of the universe—it’s called “science,” people, look it up. Second is that the Monticello AVA—with its rolling hills, rich history, and proximity to Charlottesville—makes an obvious tourist destination. And it’s often those crumpled bills lining a traveler’s fanny pack that keep a burgeoning wine region afloat. Yet many of the Commonwealth’s most acclaimed wineries lie spread throughout its eight other regions. With that in mind I’m taking you off the beaten path, into the uncharted hinterlands of Northern Virginia. My first excursion outside the Jeffersonian bubble brought me to Middleburg, Virginia. Following 17 North from I-95, I circumvented NOVA’s infamous gridlock to watch as suburban sprawl receded into mountainous stretches of vineyards and farmland. There I visited two neighboring operations that embody two very different interpretations of what Virginia wine is all about. 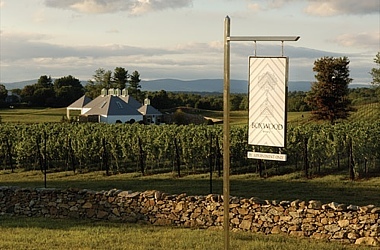 Boxwood Estate is what you would call a boutique winery. In fact, term “boutique” may not be going far enough. From the layout of the vineyard; to the cutting-edge production facilities; to the streamlined, industrial-chic tasting room; everything speaks of careful forethought and meticulous execution. Though owner John Kent Cooke (yup, THOSE Kent Cookes) purchased the estate in the late 1990’s, he subjected it to years of soil and weather assessment before anything was put in the ground. When the green light was finally given in 2004, vines were planted by laser (!) and a custom GPS system was designed to monitor vineyard maintenance. My tour guide (who, in retrospect, may have been a friendly cyborg) went on to explain how this measured approach extends to the winery’s production philosophy. Boxwood grows a mere five grape varieties (with a sixth to be planted this year) from which they produce just four wines: one rosé and three red blends. Production is capped at a scant 3,000 cases per year. With oversight by Bordeaux luminary Stéphane Derenoncourt, Boxwood’s high-tech approach is juxtaposed by a few old-school practices such as hand harvesting and manual punch down. 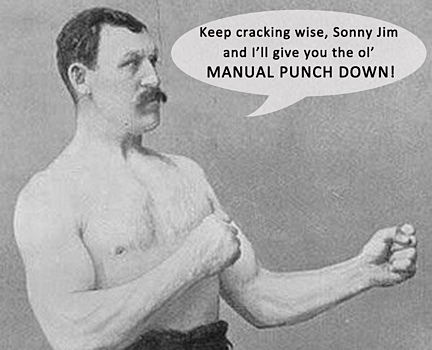 Manual punch down is the processes of reincorporating the grape’s skins with the fermenting juice by hand, and is not, as I had hoped, old-timey slang for a fist fight. Quite a lot of work for just four wines. With so many contemporaries luring bus loads of visitors with the promise of corn hole and a something-for-everyone portfolio of wine, this seems like a risky play. But damn if it doesn’t work. The wines I tasted at Boxwood were undoubtedly among the best I’ve sampled around the Commonwealth so far. The 2010 Topiary (Cabernet Franc, Merlot) was elegant and layered—easy to love from the first sip, yet seemed to bring something new every time you went back to the glass. The 2010 Boxwood (Cabernet Sauvignon, Merlot, Petit Verdot) delivered the same level of harmonious complexity but with a bolder, meat-friendly and age-worthy tannic structure. The rosé is made up of 40% Merlot, 37% Cab Franc ,13% Cab Sauv, 10% Malbec, and will probably make up about 70% of my blood stream by mid-summer. Even more refreshing is Boxwood’s price point, which, considering the high quality and low production, seems remarkably fair. The bulk of the offerings hover in the $14-$18 range, with the stellar 2010 vintage topping out at $25. Chrysalis Vineyards and Boxwood Estate are separated by three miles of gravel road and 180 degrees of winemaking philosophy. If Boxwood is a Bach partita, Chrysalis is the squelching catharsis of Coltrane solo; if Boxwood is a Rembrandt portrait, Chrysalis is a Jackson Pollack improvisation; if Boxwood is the terse prose of Hemmingway, Chrysalis is this sentence. With 71 acres under vine, Chrysalis grows an impressive array of unusual grape varieties including Albariño, Fer Servadou, Tintacao, Tannat, Tempranillo, and, most famously, Norton. Though undoubtedly influenced by her European forefathers, winemaker/owner Jennifer McCloud harbors no pretention of inventing Virginia as a Bordelaise outpost. The wines at Chrysalis are dynamic and assertive, with intense fruit character that is damn near impossible to liken to wine from anywhere else. The Albariño explodes with juicy apricot flavor; the “Mariposa” rosé is practically purple, with a deceptively dry finish given the exceptionally fruity nose and full-bodied mouthfeel. And then there is the Norton. Like it, love it, or otherwise, you have to try it (if for no other reason than I’m at a loss to describe it). It practically jumps out of the glass with concentrated aromas and a flavor that defies comparison to any common European (vitus vinifera) varietal, which makes sense considering it’s literally a different species (vitus aestivalis). Perhaps you could liken the character of a Norton to a Malbec, but with a bit more acid…and also on acid…with a kind of a wild, vegetal quality…and maybe a little tar…and also, it’s not like a Malbec at all. See why you need to try this wine yourself? Up next, we head north by northeast to meet a couple of the Commonwealth’s most celebrated winemakers. Visits to Glen Manor and Linden Vineyards when our series on Virginia wine continues! Want to learn more? Check out all of Virginia's wine regions and AVAs. And if you're looking for something specific you can search through Virginia's 210 wineries. When he’s not musing on food for his blog, or working as a server/Minister of Propaganda for Secco Wine Bar, or writing editorial pieces for various media outlets, or starring in sketches and commercials, Matt Brehony doesn’t do much of anything.